Despite faster connections, display support hasn’t improved. Apple is apparently planning to upgrade the MacBook Pro line to the latest generation of Intel processors. Benchmarks for a macOS laptop running a “Coffee Lake” chip showed up on Geekbench. The eight-generation Core i7-8559U CPU in this device has a base frequency of 2.7GHz, but a maximum turbo speed of 4.5GHz. It has 4 cores and 8 threads, and was built with a 14nm process. The purported Geekbench scores for the “MacBookPro15,2” are 16607 in the multi core test and 4448 in the single-core one. For comparison, Primate Labs, the maker of Geekbench, says the average speeds for a mid-2017 13-inch MacBook Pro are 9553 multi-core and 4606 single-core. Note the very substantial increase in the multi-core score. However, it’s possible Apple will slow the processor down in the shipping model so it uses less than 28W of power. The i7-8559U was designed to be easily downclocked to 20W. 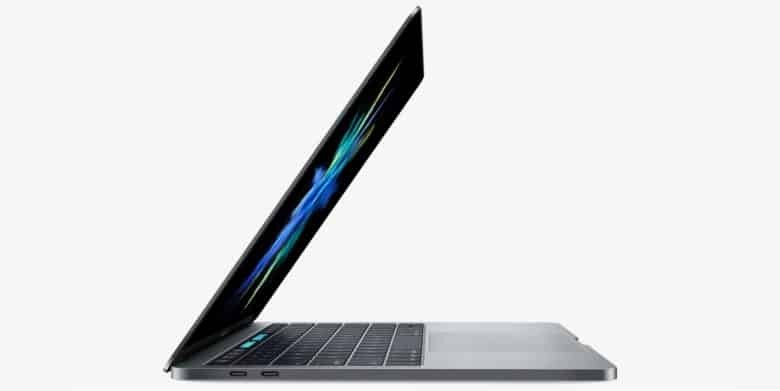 Actually, the performance of the prototype is much closer to the mid-2017 15-inch MacBook Pro, which has average Geekbench scores of 15551 multi-core and 4624 single-core. Whether this benchmark indicates the 2018 13-inch MacBook Pro will have a substantially better processor is not known. This 13-inch prototype could be built with the processor intended for the larger laptop. Or this could all be a hoax, as it’s not impossible to fake Geekbench scores. Last year’s MacBook Pro models use Intel’s seventh-generation processors, code-named Kaby Lake. These are apparently being replaced by Coffee Lake chips. The Intel Core i7-7820HQ used in last year’s 15-inch MacBook Pro was laid down with a 14nm process, and has 4 cores and 8 threads, the same as the i7-8559U that appeared in these benchmarks. The major difference in the older chip has a slower base frequency of 2.6GHz and turbo speed of 3.9GHz. The 2017 13-inch MacBook Pro employs an Intel Core i7-7567U. This is also 14nm, but has only 2 cores and offers 4 threads. Its base frequency is 3.5GHz and its turbo frequency is 4.0GHz. 2018 MacBook Pro: More RAM too? The supposed “MacBookPro15,2” has 16GB of RAM, That’s the same amount as in the current 15-inch model, but twice as much as in the 13-inch model. Again, there’s no way to know if this means Apple plans to increase the amount of RAM in the 13-inch model, whether this prototype is a hybrid, or if these benchmark scores are a hoax. It would be nice if the 2018 MacBook Pro models included a keyboard without the problems plaguing their predecessors, but that might be too much to hope for.